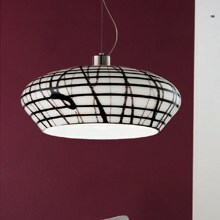 Part if a collection of glass lamps featuring a hot-modeled mesh of black glass threads. Glass tones are available in crystal and black threads or glossy white and black threads. Metal parts are in satin nickel.